What do you get when you team up a son who likes to draw faces with a mom who’s a whiz at poetry? 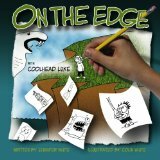 On the Edge With Coolhead Luke, which combines the best of both. When Jennifer White saw her son’s drawings, they sparked the idea to work on a book together. She then matched her own poetry to the faces with surprising results. In this sequel to Coolhead Luke, patrons visit a restaurant with an operatic chef, the Metta Four sisters share a lesson, and Uncle Marvin presents a Thanksgiving feast fit for a king. Most of these poems are written in some form of rhythmic meter, with some more unusual styles thrown in for fun. There is a glossary of terms included, as well as discussion questions about the overall messages and styles of verse. These are fun and well-written poems, with quirky and unique drawings accompanying them. I admire what Jennifer White and her son, Colin, have achieved in On the Edge With Coolhead Luke. Not only have they created interesting works of literature, but they’ve also nurtured the creative bond between them. Now that’s about as cool as it gets!